US First Lady Michelle Obama has launched a nationwide campaign to tackle child obesity. One in three children in the US is overweight or obese and Mrs Obama says the issue threatens America's future. She is setting out an ambitious plan to try to solve the childhood obesity problem within a generation. The Let's Move campaign will seek to raise the nutritional level of school meals and improve access to healthier food in deprived areas. 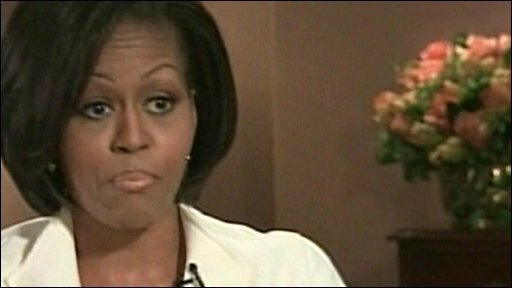 Mrs Obama has stressed that the campaign, launched on Tuesday, is not entirely hers. She has enlisted the help of politicians, entertainers and sports personalities to get the message across. Parents, businesses, schools and local government will need to increase their efforts in the area, she has said. Parents will be encouraged to enrol their children in extra-curricular sports and leisure activities. Mrs Obama has herself performed a hula-hoop routine at the White House to try to increase the profile of exercise for children. On Tuesday she told USA Today: "I would move heaven and earth to give my kids all the chance in the world for them to be at the top of their game in every way, shape and form." In his budget proposal last week, President Barack Obama called for an additional $1bn to fund child nutrition programmes. In recent years US obesity rates have stabilised, but they remain significantly higher than in most other developed countries. The BBC's Steve Kingstone in Washington says one in six children in the US is considered obese and today's children are predicted to live shorter lives than their parents. But our correspondent says Mrs Obama has been criticised for publicly discussing the issue in relation to her two daughters. She revealed how a doctor had raised concerns about the weight of her daughters - prompting the Obamas to cut down on sugary drinks and hamburgers in favour of fruit, vegetables and water. The girls were also banned from sitting in front of the television during the week. Critics suggested it was insensitive for the president's wife to comment publicly on her daughters' weight. But by acknowledging the dietary challenge facing busy working families, our correspondent says, Mrs Obama believes she can influence others - especially poorer Americans. She said last month that she wanted to make a difference. "I want to leave something behind that we can say, because of this time that this person spent here, this thing has changed."